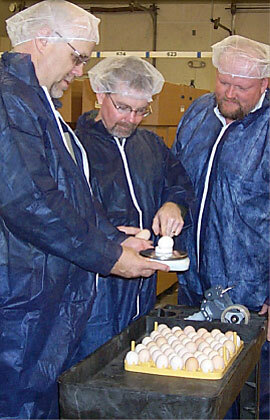 Arkansas Eggs Go Global with EXIM! The Keith Smith Company, Inc., located in Hot Springs and Cedarville, Arkansas, is the largest independent producer and provider of quality hatching eggs to the broiler industry in the United States. The company was trying to enter new international markets but they did not feel secure in doing so. Entering new markets brings about new challenges and insecurities, especially the fear that a buyer will not pay for goods once they are received. The Keith Smith Company turned to EXIM’s export credit insurance so they could feel confident selling to new international markets. The insurance ensures that even if an international buyer does not pay, the Keith Smith Company will be compensated for up to 95% of the sales invoice. EXIM insurance reduces the cash flow risk to The Keith Smith Company and allows them to be more comfortable as they grow into new foreign markets. Since working with EXIM and exporting new markets in 2009, the Keith Smith Company has supported 42 additional jobs and their sales have increased almost 50%. Exports as a percentage of total sales have grown from less than 1% to 61% in nine years of working with EXIM. Between 2016 and 2018, EXIM has supported over $10 million of Keith Smith Company’s sales.